My father grew up in Wisconsin and my mother grew up in England. They met in Germany, married in Phoenix, AZ and now live in Sedona, AZ. In between they had some kids, dogs, cats, grandkids and lots of anniversaries. Saturday they had another one, anniversary that is. We only have one photo of their wedding day and it's from outside the church. 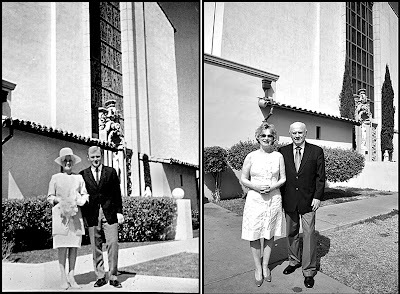 Andrew Henry decided it would be neat to take a photo of them in the same spot on their anniversary for a "then and now" - so that's exactly what we did. So sweet. I love the before and after! We celebrated my on laws 40th anniversary this weekend. What a sweet and truly touching post...loved this! They haven't changed a bit. What a handsome couple. Happy Anniversary. How interesting! And I love recreating photos! I have a few photos of my grandparents I would love to recreate some day. There is one of my grandmother in front of the flat where she and my grandfather lived in the early years of their marriage. It's here in San Francisco and I've been to it. Just haven't gotten around to it. This is really sweet. Happy anniversary to your parents! I don't mind that your Mum doesn't have a hat or flowers, it looks likes a wonderful "today" photo. And yes, they are so cute ! Love this! I would have never thought to recreate that moment, but it is a lovely pairing! Oh I love how you took their photo in the same spot! That's fabulous! It was a good idea! We wouldn't have thought to do it. awwww that is the sweetest thing ever!!!! They're beautiful, then and now. were on the BIG DAY! You know how I love the before and after shots! I think this turned out great! I LOVE this! Such a great idea, that Andrew Henry ;) Congratulations to everyone on that anniversary! Just live this - they are simply charming! And look just as happy to be together as in the original shot!! 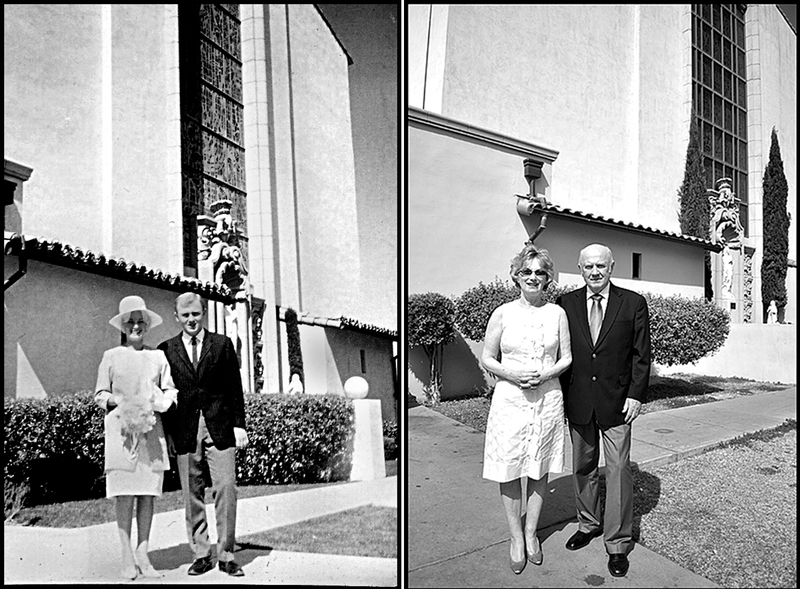 So cute- just like the Back to the future photography series- I love it- Happy Anniversary to your parents. What a lovely idea that is - and what a photo to treasure for all of you. You don't even know how much I love this!!!! I love then and nows!! they are perfect. Happy Anniversary to them! Two of my very favorite people - looking ever so Mah-vah-lous! Happy, Happy Anniversary you two! I love the B4 and Afters too AH! Love those circles! And a happy way to celebrate their anniversary. Jeanette how wonderful, they look so happy together. A very special memory! Thank you all for good wishes! what a hoot! they have not changed at all. your brother sure looks like your dad! happy anniversary to them! I just love that...What a great idea! I've said it before, I'll say it again - that Andrew Henry is a gem! Great idea to celebrate these two most precious people in your life and their enduring relationship with each other.